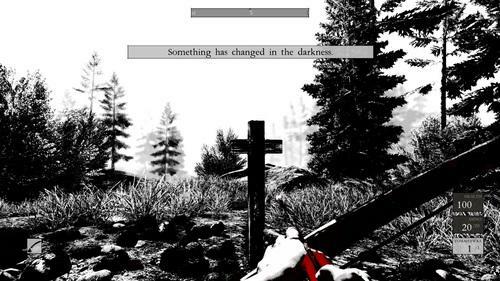 Mystery is the lifeblood of the grey-scale world that Blackpowder Games created for its debut effort, Betrayer. Spurts of red seep into the black & white spaces shown off in the game’s reveal trailer in much the same way that the plot’s secrets are revealed gradually, as you explore deeper. The premise: it is 1604 and you are a shipwreck survivor bound for a Virginia colony that turns out to be deserted when you arrive. It quickly becomes clear that something dreadful happened here, and you’re left to find out what. 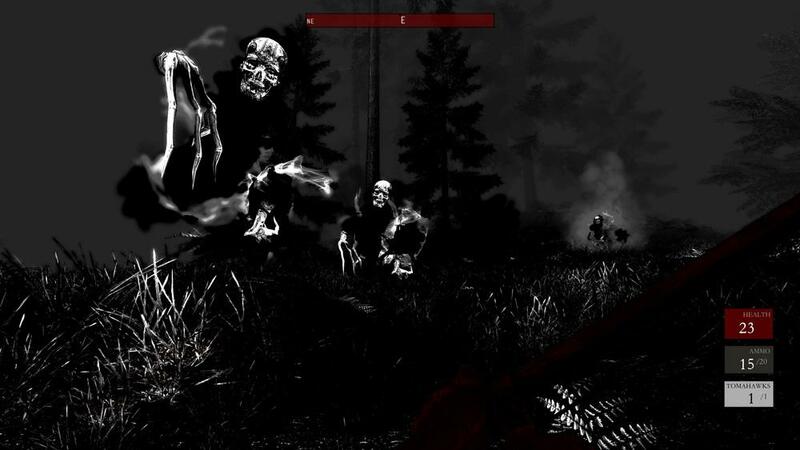 It’s not the action that sells Betrayer, but rather the striking black & white art style. There’s nothing quite like it out there in the wider gaming world. 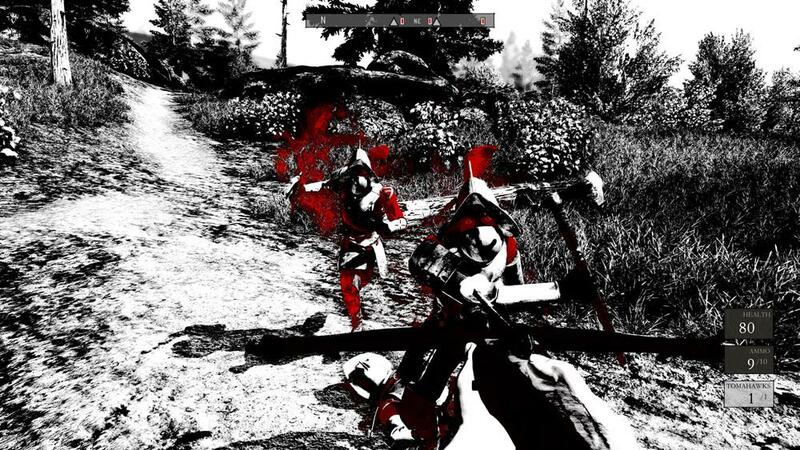 Platinum Games’ blood-soaked Wii exclusive MadWorld comes close, but Betrayer is much more sparing in its use of red. This isn’t the sort of action that spatters blood across your field of view; Blackpowder injects color to serve as more of an indicator, a guide to help you find your way through 19th century America’s forests and forts. If you see a flash red in the world, it’s something you ought to explore further. Hubbard compares the result that he got to Frank Frazetta’s (of Fire and Ice fame) black & white comic book work, something he’s a self-professed fan of. He realized as he played around with the look in UDK that he was on to something. The details that you lose using this more stylized look are automatically filled in by the player’s brain. “The Law of Closure describes how we can take little pieces of visual information and our brains are wired to interpret them into images,” Hubbard explains. It’s like watching a motion-capture session during the recording process. The actor in the suit is is a flesh-and-blood human in the performance space, but he or she is rendered by the computer as a bunch of connect-the-dot points. Your eyes see dots on a screen, but your mind decodes and identifies it as a wireframe human form. Betrayer‘s look is similar; you don’t see every little detail, but the spaces and objects within them are laid out in such a way that you’re able to spatially orient yourself. There’s a very large world designed around this unique look. Hubbard compares the makeup of Betrayer‘s environments to GSC Game World’s S.T.A.L.K.E.R. games. The entire region is broken into smaller (but still large, and open) loading areas for you to explore. There are seven of these in all, plus an eighth introductory area. As you work your way through each one – occasionally backtracking with the help of a fast-travel feature – you slowly start to understand more of the mysterious circumstances that led to this colony being deserted. “It’s not actually totally deserted,” Hubbard says. “There is a woman in a red cloak who is communicating with you by means of firing arrows with notes attached to them. You don’t know why she’s doing that, but it factors into the story.” Players will also find loot and other secrets hidden away, as well as spectral quest-givers and store chests – an admitted video game-y contrivance – where ammo and improved weapons can be purchased. That’s not the focus, however. Betrayer‘s planned Steam Early Access launch, set for August 14, 2013, serves up only a small chunk of the full experience. Just the introductory area and the first full environment, amounting to only a couple of hours of play. 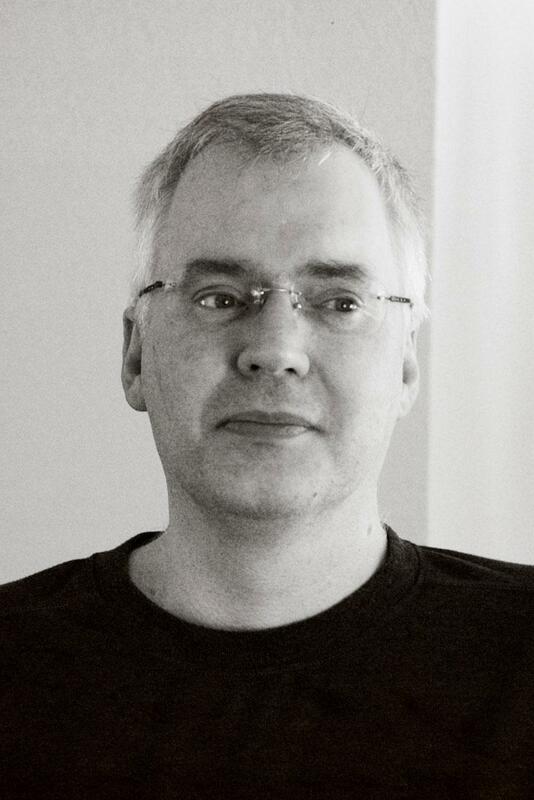 Hubbard promises a “very regular release” of new content after the initial launch. The piecemeal delivery is entirely a product of the team’s long-held appreciation for playtesting as well as a desire to ensure that the various bits and pieces of Betrayer work before too much effort is poured into the larger game.